The upwardly mobile Scalevo wheelchair is like the electric wheelchair’s badass cousin. 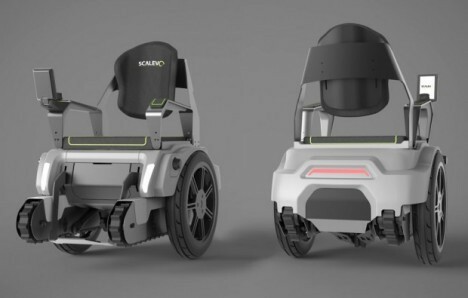 Looking a little like a motorcycle and inspired by Segway technology, Scalevo balances on two wheels. When it approaches a set of stairs, a pair of tank treads extend to let the chair easily ascend or descend with no outside help. The Scavelo rolls around nimbly on its two wheels; when the rider needs to climb a staircase, he backs the seat up to the stairs. 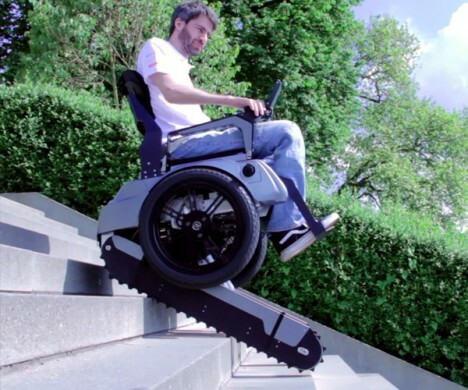 The seat lifts up a bit to keep him level at all times, at the same time exposing the tank treads. The treads slowly roll up one step at a time. At the top of the stairs, a tiny set of wheels pop down to make a smooth transition from stair-climbing configuration to the regular riding configuration. Even when not traversing staircases, the Scavelo is pretty impressive. 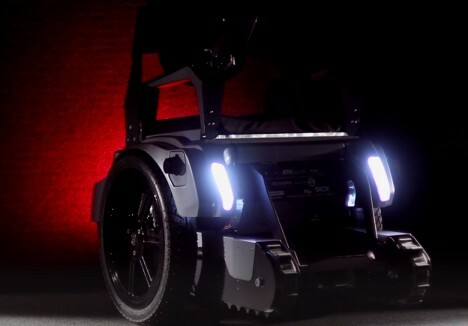 It’s equipped with headlights and taillights and a body that is far more attractive than we’re used to seeing on a wheelchair. The current iteration of the Scavelo doesn’t move very quickly and the climbing modes have to be set manually, but those issues will be resolved as the technology is refined further. Created by a team of ten electrical engineering and industrial design students at the Swiss Federal Institute of Technology and the Zurich University of the Arts, the Scalevo seen here is a prototype. The students behind it plan to enter it in Cybathlon, an athletic event for physically disabled people using assistive technology.